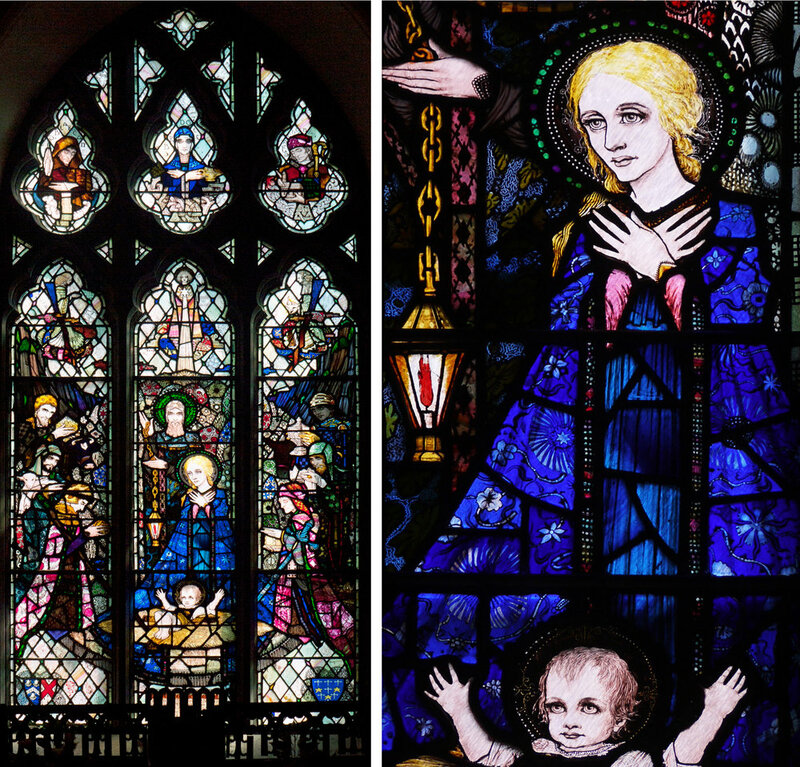 When I first started looking at stained glass I was drawn to the work of Harry Clarke. This was in the 1970s and I was a teenager who collected fairy tale books, so it's easy to see why I liked his style. I found his work as interesting and intricate as the medieval glass I loved, without falling into the trap of trying to copy it. 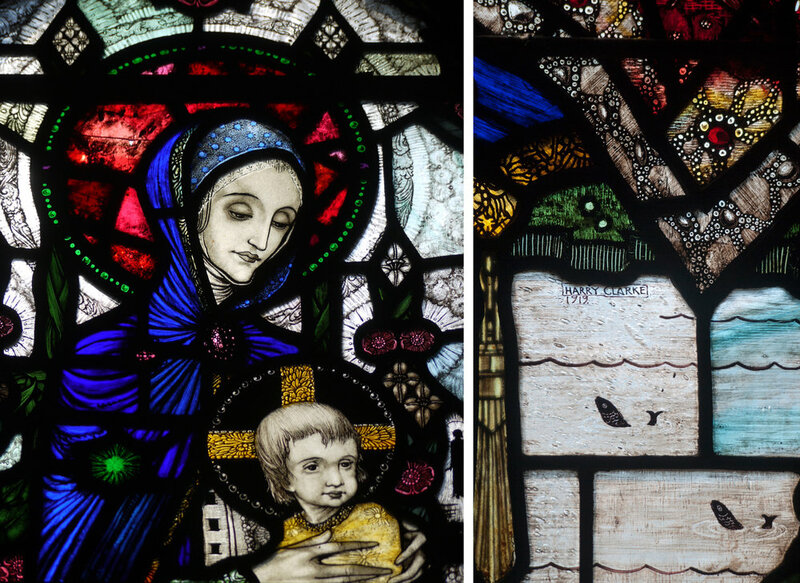 As my opinions were formed from the pages of books, I realised that it was about time I took a trip to see some of his windows in the churches of Ireland. Church of the Assumption, Wexford 1919 - whole window and detail of St Aidan's gorgeous cape. First stop Wexford, the Church of the Assumption and a 1919 commission showing the Madonna with Saints Aidan and Adrian. For all of the windows, I've shown the whole window in the first picture because it is the originality of the composition - no conventional borders or figures squeezed under canopies - that I think sets Harry Clarke windows apart from most of the others. Obviously the details are gorgeous, but I don't think beautiful glass painting and etching is as hard to do as a convincing set of figures. The face of the Madonna (below), with background patterns circling her ruby halo is quite mesmerising. There's not too much colour in this window and it works perfectly in the space. In the scenic church of St. Barrahane in County Cork, there are three HC windows, the earliest is a three light Nativity window from 1918. The face of the Madonna again holds your attention and makes an interesting comparison to Wexford, as does the background to the figures, which is split up in a more conventional diamond pattern made of pale textured glass with blobs of deep colour. My favourite part of this window are the angels at the top of the main lights, particularly the jazzy parts behind the figures where the patterns break out of the diamond formation (below). I was expecting to see the figure of St. Luke (below) in the same church, but hadn't realised how small (less than a metre tall) and therefore exquisite the window would be. Another fabulous face surrounded by small saints, sections of pattern, coat of arms and inscription. There is a little head of the Virgin Mary on the olive coloured palette in the Saint's hand, another piece of wonderful detail and a great colour contrast. There are also three HC windows in Christchurch, Gorey in County Wexford (I've not shown my least favourite window in both cases). This is a large church, the windows are lofty and somehow less overwhelming. However the one showing St Martin of Tours with the beggar and the the gorgeous St Luke has a great composition with a diagonal emphasis, tiny figures above and below and a fabulous dark blue oval of landscape that seems to drip off St Martin on the left. As the detail of the tiny St Luke shows, these are lush 1920s landscapes, the brushwork on the pale glass is subtle and organic. The tall St Stephen window has the most fantastic border, five rows of round beads and lovely inscriptions at the bottom. The commission is in memory of Percival Lea-Wilson, a member of the Royal Irish Constabulary who was shot by Republicans in 1920. Above the stiff figure of the martyred St Stephen, with stones patterning his clothes, is one of those Clarke angels with protective outstretched arms and a gaze, for once, looking straight at you.